hidden experience: Owls as moderators in a debate! Owls as moderators in a debate! A woman named Linda contacted me with a wonderful story. She's an experiencer and she had this to say about owls. There was a correlation between the owls and some of the contact experiences. For instance, I'd be reading, suddenly think of the ET's and one of the owls would start hooting right over the house. Or I'd feel the ET presence outside, walk out the door and the owls would call to me from another part of the property. These events were so frequent in the beginning of my experiences that I have no doubt as to the synchronicity. It's been proven in my mind, so I'm was a believer in owls as ET's or messengers of the ET's before I ran into your work. While in college Linda was engaged to a brilliant scientist named Ed. They eventually broke it off and went their separate ways. 30 years later they met up again, and Ed ended up moving in with Linda while looking for an apartment in her area. During this time they would sit together behind her house in a small meadow surrounded by longleaf pines and mature oaks. This was also a spot frequented by owls. Linda said that Ed was heavily invested in the materialistic sciences. If something wasn't proven with scientific instruments, it didn't exist. Ed and Linda were in the back field arguing about the difference between proof and belief. She said, “It was getting heated as Ed and I could easily be described as intense when we got into this stuff. We were both convinced of our absolute ownership of 'the truth' as fact." Ed and I were arguing about the existence of extraterrestrials. That was the crux of the belief vs proof debate. As an experiencer I of course believe, as a scientist Ed felt there had to be physical proof that had been examined by scientists and released to at least the scientific community. He said that belief without scientific proof was as invalid as religion. You must be able to spit out the word religion with a significant amount of disdain to get the full import of his intent. For my part, I was frustrated with my ability to describe how once you've experienced the things that I had, belief wasn't something someone told me about or something I believed because another person recounted or duplicated an experiment, it was a reality. There was a microsecond of silence after my statement, but only a microsecond. Then a chorus of owls directly over our heads went into simultaneous tumult! Up until then we had NO idea they were even in the vicinity. Four, maybe all five family members were perched on top of us and in that instant they all shouted together. 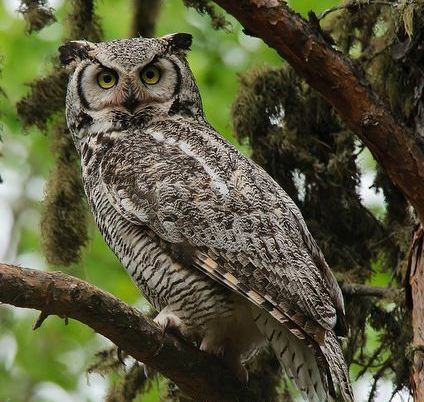 Now, these great horned owls, and as you probably know, they're very large birds and very loud. We never saw them even though it was broad daylight, as they exploded in obvious agreement and applause to my concluding argument. I didn't say another word, I didn't have to, choosing instead to let the experience stand on it's own. Adding anything to that stunningly synchronistic goose pimple moment couldn't have served any purpose. I just looked at Ed and he looked at me. Neither one of us uttered a sound, we got up and left the field, walking silently toward the house. We never spoke of this event or had this discussion again. That time the Owls got the last word! And with Ed and I that was pretty darn hard to do. I love this story! It's playful and the punchline is perfect. Owls as the moderators in a debate between an experiencer and a scientist. Right on for those owls! Actually experience is the opposite of belief. Our system calls indoctrination education. You will notice this is because our education system is modelled off of the church. Anyone as I have who goes to ghost towns will notice the schooling took place right inside the church. This is why school houses today have a bell, give books/reference/biased opinion(ideology and controlled information), has desks laid out like pews, has a pastor stand in front of a seated unquestioning congregation, because like the church their job is to demonize experience and dumb you down and control you with opinion. Lies, belief, faith and opinion in place of master apprentice real world experience. Which you will notice you still have to have even after 8 years and a childhood spent schooling. Its called a waste of life. Real learning is experiencing, you have no requirement for things like belief and faith when you have had experience. I've tried to figure out why I am so different from EVERYBODY around me and you know I have never had faith and don't worship authority. Maybe this is why my experiences are good. They who ever they are know they don't have to convince me humanity is ! @#$ and our system is nothing but a tyrannical play ground. Our system exists to purge individuality to make individuals join groups that use leadership to syphon hopes, dreams, effect, our future. Our society makes people think something's wrong with them for not fitting in. The truth is the group leader is syphoning your power does a leader fit in? No he uses your belief and faith for control. And the congregation of followers are all traitors of the self fake, lying, mass hysterical sellouts. My whole life has been exposing all the humans around me as the frauds they are. And I wondered how could this be? The great philosophers gave me my answer. Freud is a complete fraud is name is one letter away. this is the man for which we get the term ego I sickly hear mentioned on every tv and podcast show. Read Socrates, Plato, Aristotle, and you will notice something. these great thinkers had already proven the symptoms of weak ego are the required functioning for a normal person in a democracy. People do not understand what democracy is. Hell I'm the only person I know who read the whole constitution and went there's no democracy not one time written into it? So I went to the index, doesn't exist in our law of our land? Then I went a and researched what the forefathers thought, 2 wolfs and a sheep deciding who gets eaten, when 51% of the population takes away the rights of the 49% mob rule? How did our system fall so far? Education, the new church with the ecclesiastic academic papacy. I don't mind when people who have never experienced the paranormal don't believe in it because that is how it should be. You shouldn't believe because humanity as I have experienced my whole life is one big lying organism. Maybe that's the metaphor of the old trees of life. Once your rooted in bull@##$ reality can't be digested.